In the last few years, the process of announcing wedding dates has transformed into a game of one-upmanship on Facebook, with each couple eager to gain the most feedback from friends and relatives. While a social media announcement is essential in this day and age, there’s still something special about receiving tangible wedding announcements. Consider spreading the great news with one of these new ways to say save the date! Instead of standard black and white engagement photos, show your silly side by creating a parody of the poster for one of your favorite romantic comedies. Mr. And Mrs. Smith and How To Lose A Guy In Ten Days are both perfect for this approach. Who doesn’t like a sweet treat? Add a special touch to your save the date by ordering mints or some other type of candy, with all the essential information included on the wrapper. From informational articles to workplace flow charts, the infographic is the ultimate in effective communication. Offer up a modern touch to your save the date by sharing all the details in a straightforward, but unique infographic. 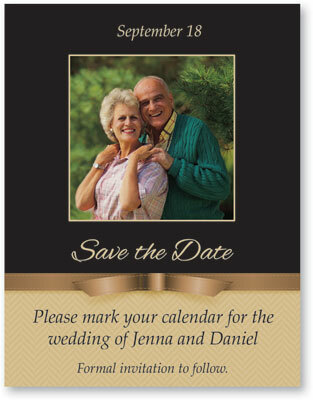 If you or your fiance already has kids consider including them in the save the date. A goofy 80s family portrait — complete with big hair and mullets — should provide plenty of laughs for the lucky recipients. If there will be several events taking place in the lead-up to the big ceremony, consider sending a calendar magnet marked with all the important occasions. Feel free to spice up the calendar with a unique background picture. Magnets in general make excellent save the dates. If you’re planning on throwing a getaway wedding, consider sending beach-themed magnets to get your invited guests excited for the big trip. If you’ve already chosen the songs for your ceremony and reception, why not share them on an exclusive save the date CD? Feel free to share all the specifics related to the wedding on the front of said CD. If nothing else, this will provide a little entertainment for those forced to drive across the country for your big day. Your save the date will communicate the essentials about your upcoming nuptials while also setting the tone for your ceremony. Think outside the box and send reminders that guests will remember in years to come.